Stefanie Gross was a long-term observer (LTO) for the Carter Center's election observation mission in Nepal from March-December 2007, and wrote her reflections during this time. Originally from Germany, Stefanie completed her undergraduate degree in political studies and her postgraduate degree in conflict resolution in the United Kingdom before interning at The Carter Center in 2006. I arrived in Nepal in March 2007, and after a briefing at the Carter Center's field office in Kathmandu, was deployed with my team partner to Biratnagar-hub of one of Nepal's five development regions. The main towns of the other four regions host similar teams of two international LTOs, while a roaming team tackles the most remote areas of the country. Nepal's citizens are to elect a constituent assembly tasked with writing a new constitution following the 2006 "People's Movement" for democracy and signing of the peace agreement between the government and the insurgent Maoists. As LTOs, we monitor the electoral process by observing and assessing technical preparations as well as the political and security environment. To this end, we travel by plane, car, or foot to the districts of our region to talk with government, political party, and civil society representatives and citizens. Planning field trips involves assessing road, flight, and trekking conditions and arranging transport, accommodation, and meetings. Sleeping facilities are usually basic and often entail knocking on a family's door along the trekking path. After each trip we return to our base in Biratnagar to write reports, restock supplies, and recharge our batteries. Nepal is unique in many respects, but the most challenging aspects for us are its incredibly diverse climate and geography. In an area of 125 by 500 miles, Nepal hosts not only some 59 ethnicities and 100 languages but five climatic zones ranging from tropical to arctic, as well as three geographic zones ranging from the Terai plains to the highest mountains in the world, the Himalayas (home of Mount Everest, or Sagarmatha, as the giant is known here). Most of the countryside is difficult to access. Five of our region's 16 districts have no roads, so it is not unusual to set off by car, continue with a tiny plane, and end with a one-hour to two-day trek, while temperatures fall from 100ºF to 50ºF. We have had many unforgettable experiences and encounters and enjoyed some spectacular scenery. I have been surprised by the insight LTOs gain into the socio-political and cultural life of a country, and I never stop being amazed by the openness and hospitality with which Nepalis have received us as visitors and Carter Center representatives. Even in the most remote places, the name "Jimmy Carter" prompts a first nod and hearty smile in every meeting and encounter. I have learned a lot from my work as LTO over the past months about my field of study, about Nepal and, importantly, about mission life. It has been rewarding to see how quickly we have settled into a country where every day is both intimately foreign and strangely familiar. And, not last, I have met amazing people and seen, yet again, how life in difficult circumstances lets us all move a little closer together. In a country where some 30 percent of the population lives below the poverty line, 40 percent is illiterate, and life expectancy is almost 20 years below that of most so-called developed countries, many things we have seen over the past months have been moving and unforgettable. There were several moments during physically and mentally challenging field trips when a part of me wondered why I am doing this. But then you step outside of the lodge into one of Nepal's unforgettable sunrises, and you have the first meeting of the day, and after the introduction our meeting partners look up, smile, and say: "Carter Center! Swagat! Welcome! You have come from so far to help us! Your visit gives us hope – now we do believe that the elections will really arrive!" 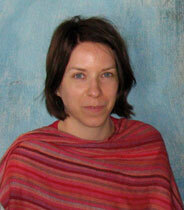 Stefanie Gross, long-term observer for the Carter Center's election observation mision in Nepal during 2007.